...and on earth peace, good will toward men. Interestingly, these famous verses begin with the same phrase in multiple translations of the Bible -- but I'm going to go out on a limb and guess that somewhere between few and none of the readers here quoted the New International Version ("The LORD is my sheperd, I lack nothing. "), the Holman Christian Standard Bible ("The LORD is my shepherd, there is nothing I lack.") or the Good News Translation ("The Lord is my shepherd, I have everything I need."). This year marks the 400th annivesary of the Authorized Version -- more commonly called the King James Version (KJV) -- of the Bible. For 300 years, the KJV was the translation used in English-speaking Protestant churches across the world. Then in the late 20th century, an explosion of new translations ignited "translation wars" only slightly less bloody than the "worship wars" of the same time period. Just like the hymns-vs-praise music controversy, churches grappled with whether they should stay with the familiar KJV or switch to a translation more accessible to the modern ear. Have you ever been to a worship service where the pastor or reader read from one version, the Bible in the pews was a different version, and the Bible you brought from home was yet another? And then there is the fun of being in a Bible study where everyone goes around the table reading a verse, and you discover everyone in the class has a different version. It's enough to make one long for the days of uniform KJV usage despite the thees and thous. But did you know King James I commissioned a new translation of the Bible to end the "translation wars" of his era? At the time James ascended to the throne of England, several competing Bible translations were in use: the Great Bible (based on Tyndale's translation and authorized by Henry VIII for use in the new Church of England), the Bishop's Bible (a revision of the Great Bible during the reign of Elizabeth I), and the Geneva Bible. The Geneva Bible caused James the most distress. During the reign of Mary I (known to history as "Bloody Mary"), many English Protestant leaders fled to John Calvin's Geneva to avoid persecution and execution. There, they completed the first English translation directly from the original Hebrew, Greek and Aramaic. Burgeoning literacy and inexpensive printing put the Geneva Bible in the hands of ordinary people. With a price of about a week's income for a lower-class laborer, nearly everyone could afford his own Bible. A 1579 law in Scotland even required all households with sufficient means to purchase their own copy of the Geneva Bible. The Geneva was also the first English language Bible to number verses. Marginal notes authored by John Calvin, John Knox, Miles Coverdale, and Theodore Beza made the Geneva Bible the first English "study Bible." These marginal notes lent the Geneva version a decidedly Calvinistic slant and made the version decidedly unpopular among the Church of England's senior level clergy. Worse, as far as the king was concerned, some of the notes were downright seditious to a man who believed in the divine right of kings. What to do? Order his own translation, of course! The Authorized version drew heavily on the Geneva Bible, but without the offending marginal notes or Calvinist slant. By the end of the 1600's, the KJV overtook the Geneva version as the Bible of choice for English-speaking Protestants -- aided, of course, by the fact that King James even made ownership of the Geneva Bible a felony. But the "damage" had been done. The Geneva Bible continued in print until 1644 (nearly half a million Geneva Bibles were printed) and in use for decades thereafter. It gave rise to a movement within the Church of England called the Puritans and a belief among the English people that the king was subject to the people, and not the other way around. 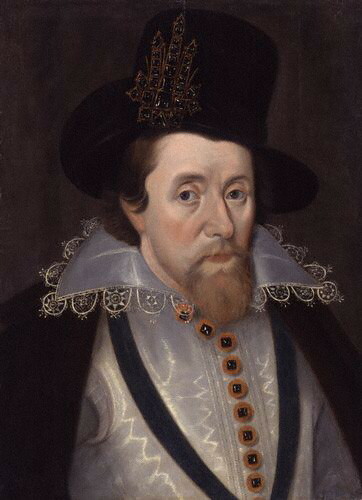 James's son Charles I lost his struggle with Parliament (and his head) over the divine right of kings issue, and no English king has publically subscribed to that belief since. English colonists at Jamestown brought Geneva Bibles with them, as did both the Pilgrims and Puritans in their colonies further north. In fact, the Geneva Bible was the principle version used in colonial America throughout the 17th century. One can easily see how a people who believed God doesn't require obediance to tyrants would later rebel against a tyrannical government. Sadly, most English speaking people are unaware of this bit of Bible history and how it affected world history. Even Biblegateway.com doesn't include the Geneva Bible in its list of English translations. However, for grins, I'll give it to you. Here is Psalm 23:1 from the Geneva Bible: "The Lord is my shepherd, I shall not want." Looks familiar, huh? So which translation do you use? Do you have a favorite? Do you do like I do, read one translation for content and yet keep the KJV for its familiarity and poetry? What translation do you use when you assign your children to memorize verses? Interesting. My favorite version to read is the Message. It is actually translated straight from Greek and Hebrew, unlike most modern versions. It always has a fresh slant. But I usually have my kids do their Bible verses in more familiar versions like NIV or NKJV. Hi, Dina. I'm one of those with a lingering fondness for the KJV -- at least, for the most familiar passages. I also insisted my kid memorize the KJV version of passages like Psalm 23. For regular reading, I'll use the NIV, and when I have questions, I'll look at other versions. I like the notes in DH's study Bible (an NIV) better than in mine (a KJV) -- but it's good to have both opinions. Thanks for the history lesson, C.J.! I didn't know about the Geneva version--in fact I learned a lot here. I like a variety of versions NKJ, KJ, NIV and the Message, but I love references to the original Greek NT. I'm thinking I'd like a nice history course to expand what you've talked about today. Interesting post, CJ! Timely, too, as we've been discussing the difference between Pilgrims and Puritans in our house. What a complex period of history that was! We have numerous translations in the house, but I tend to reach for my well-worn NIV. The kids have NIVs as well. I have a KJV right here by the computer, however. Deb, I kind of stumbled onto the story of the Geneva version myself. I was writing a book set in 1610 -- and then I decided to check the dates for the KJV. When I realized the KJV didn't come out until 1611, I had to research what Bible English-speaking people used before it. As for the Greek, etc., what I read was that previous English-language Bibles were translations of translations, so they were several steps removed from the oldest manuscripts. The translators for the Geneva Bible decided to start with the original languages and translate directly from them into English. What I read is that the fall of Constantiople (to the Turks) caused some of the Eastern Christians to flee to the West, and they brought some of the old manuscripts with them. Susie, hope you found some good resources for your Pilgrims/Puritans. When son #1 was younger, we were looking for children's resources about the Puritans. I could find books about the Pilgrims, but for the Puritans, the only kids books I could find at the library were about the Salem witch trials. It was like the Puritans contributed nothing else of interest to American history. Very annoying. Well, I tried to comment once, trying again, we'll see if Blogger eats it again. I love history day at Inkwell! Stuff like this just fascinates me. I have a fondness for the good ol' KJV, but in my personal reading I usually go with the English Standard Version. It is supposedly the most accurate English translation. Fascinating post, CJ. I use the NIV, but every time Dina quotes from The Message, I think about getting that translation. I grew up with the KJV, and used to love paging through looking for those gorgeous colored pictures. I had not heard of the Geneva translation before, or if I had, I've forgotten. It certainly does put a new spin on historical events. I started out with King James, then for a period of time was enamored with the NIV. But after more study, ended up back with the KJV because of my personal views on the texts used to translate various versions and how that plays out in key passages. I try not to be militant about it though. I know there's a lot of that still out there. So much, in fact, that whenever I mention I use the King James I often get a backlash of people's frustration over their encounters with someone else. So I sit there and smile stupidly. Lisa, I wasn't familiar with the English Standard version, so I had to look that one up. I seems to look a lot like the New King James. Interesting. Suzie, I'd heard of the Genevan Psalter (before we moved to this area we attended a church that still had a psalter -- hmm, post for another day maybe), but I only learned of the Geneva Bible recently. Barb, you are far from the first person I know who still uses the KJV. (My study Bible is a KJV, and I just got it a couple years ago.) That's why I found the history of how the KJV came to be so fascinating. And as a side benefit, I think kids who have a familiarity with the KJV have an easier time understanding classic literature. You know I found it a little heartbreaking in Seychelles, they've only ever had one translation into their Creole tongue. It came out in the 90s and only a few hundred were ever printed, then something happened and the printers packed up and left the country. Those Creole translations are almost impossible to get. We searched and searched while we were there. Can you imagine not being able to get a Bible in your language? That's the way it was for everyone for hundreds of years. Even if they can be frustrating, I'll take the translation wars over no translation at all! Fascinating post, C.J.! Now I want to find a Geneva bible to read next year. I try to read through a different version/translation every year. For studying and memorization I usually go with the NKJV or the Amplified, but also love the Message and the NIV. We've had those horrible experiences with the militant KJV only set. I get mad until they say something foolish like "the KJV is the Bible Paul preached from." Niki, I think it is so awesome that you read a different translation every year. Very cool!